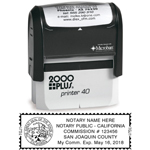 To order a California notary stamp, send ORIGINAL "Certificate of Authorization" issued by the Office of the Secretary of State (no faxes or photocopies accepted). This certificate authorizes a maximum number of stamps for that notary. If you want to order more than one stamp, the "Certificate" must authorize as such. We affix a copy of the stamp to the "Certificate of Authorization" and send the original to the Secretary of State. A copy will be retained by our company, and one will be sent with your stamp. 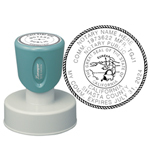 We make notary stamps for all 50 states. 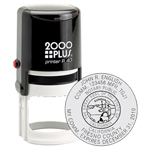 Please contact us at 1-800-237-9351 or orders@spectrastamps.com if you wish to order a notary stamp or embosser for a state other than California. SEM158: Hand Held Seal Embosser 1-5/8"